As we solider on through this miserable, bleak winter, I can only think of sunnier things to get me through my frozen days: bare legs, sundresses, April showers, May flowers. And after the Alice + Olivia show during NYFW earlier this month, it's that last one that has got me the most excited. The fresh flowers accenting the chic chignons atop the models' heads have me dreaming of sweet-smelling springtime — and accessories to match! After these past few months of frigid weather, my hair daily 'dos have left something to be desired. Necessary hoods and hats have resulted in little volume, tons of frizz, and boring ponytails. But spring days are on their way and with that comes beachy waves, sunkissed strands, and floral hair accessories. So stop and smell the roses with Alice + Olivia and jump on this blooming trend! While the fresh red, leafy gerberas in the brand's presentation were delightful, bold, and all kinds of gorgeous, plucking fresh flowers from my nonexistent New York City garden every morning to twist in my tresses, doesn't exactly fit into my schedule. But these floral hair accessories below are just as pretty — and will last way longer than just a single jaunt down the runway. These dainty chains accented with bright pops of blooms have an ethereal, other-worldly type of beauty to them. Pop a few of these beauties in a braid or scattered throughout an updo for fairy tale princess locks. The ivory looks lovely in darker hair shades and the dainty size keeps you looking soft and bohemian. Equal parts retro glam and senorita sizzle. 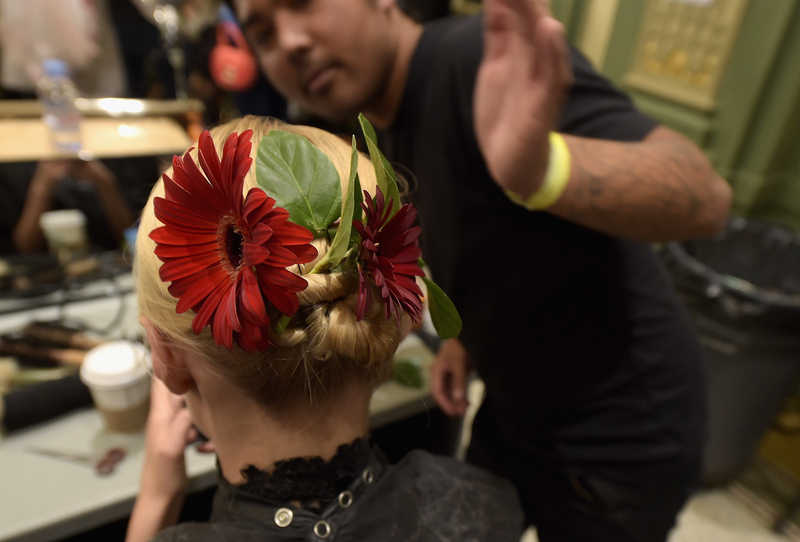 The easiest way to get flower goddess worthy hair.